The Royal Burgh of Falkland, the Falkland Islands, in the South Atlantic Ocean is named after it, is a small conservation village nestling off the beaten track, tight beneath the Lomond Hills. It's an unspoilt conservation village, but hidden behind its medieval mask of buildings is a thriving and vibrant functioning community that is a real pleasure to visit especially during the summer months. The famous palace, built by King James IV as a hunting lodge five hundred years ago, shows the strong influence of the French court in its architectural style. 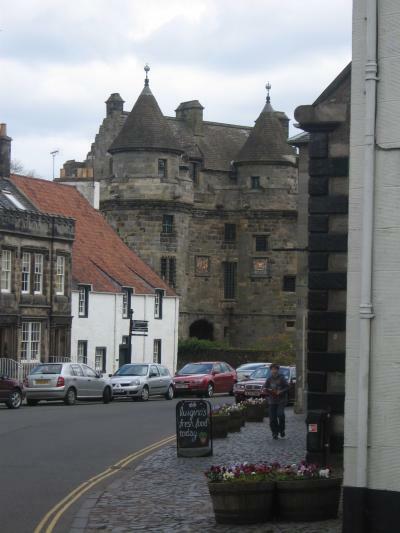 All over Scotland, there are many examples of France's great cultural influence but architecturally Falkland Palace is, I think an early and unspoilt example. The Scottish kings, as far back as James I, had long visited these lands, with their vast forests now long gone, to hunt deer. The local lord, the Bruce, had annually been inviting the king to join his hunting party long before the palace was built. Now, it dominates the village and is perhaps the main destination for most of the overseas visitors to the village today. 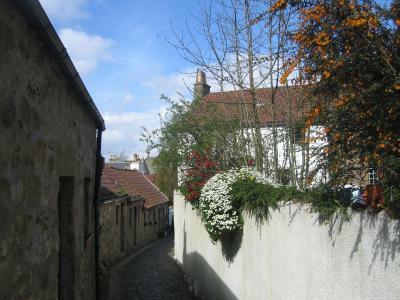 One of the features of old buildings throughout Fife, the country surrounding Falkland, particularly among the many pretty fishing villages along Fife's coast, are the pantile rooves of the little cottages. They are so numerous, it would be easy to assume they are locally produced. This is, however, far from the truth as they do in fact illustrate the importance of continental trade along this coast. So rich were the catches of fishhere that the fleet would sail off to the more populated German, Dutch, Flemish & French coastal towns to sell their catches. In return, as a form of ballast, the fishermen would load up their holds with cheap Dutch pantiles. In truth, these pretty rooves tell of the very close trading relationship Scotland had to the continent. Perhaps, one might say, Scotland was in those days much more "European" than its cultural giant south of the border. 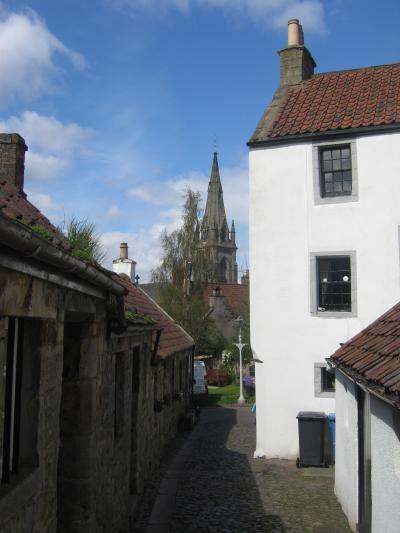 Falkland today boasts potteries, artists' studios, restaurants and pubs as well as a couple of delightful tea shops where one can try a Scottish pancake-for me at least, a delicious alternative to the more famous English scones with clotted cream. The palace also has in its grounds the oldest lawn tennis court still in use anywhere in the world. Probably, the game was brought over by the French five hundred years ago. 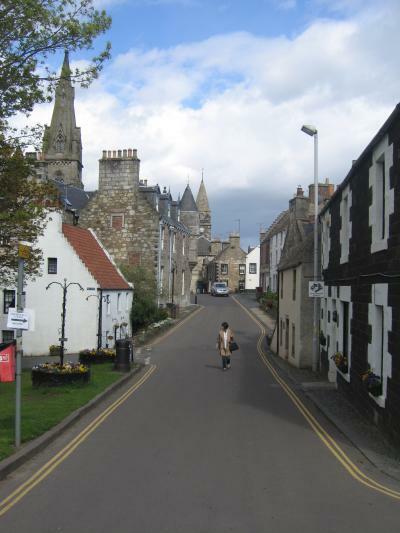 Around the town one sees any number of students whonow live there; St Andrews University is nearby and, for those with transport at least, it is an alternative place to live. 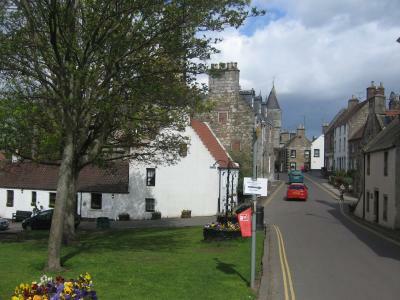 Falkland is only a forty minute drive or so from Edinburgh and a very pretty destination. In July an unusual "Big Tent" Festival is held where musicians from Africa and South America as well as from India and other countries, join local artists and craftsmen for a coming-together of environmental minds. For us, not only in the gentle moods of summer, it is a favourite place for us to visit for a quiet moment. One can wander around the tranquil lanes, share an afternoon tea together, or take a look at the palace gardens where the tennis court can be found, one can even buy plants grown there, as you will no doubt see if you visit us; not only can we take you there but our garden contains two very handsome Magnolia trees bought in the palace.